Traffic Stop, Driver Arrested for Narcotics, LIVINGSTON, October 5, 2013 - Shortly after 6 pm on October 5, 2013, Narcotics Investigator, Vance Berry made a routine traffic stop of a tan Buick Sedan on Pan American Drive and Brock Avenue in Livingston. 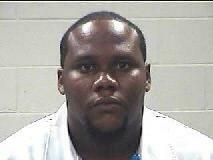 Berry was quickly backed up by Narcotics Investigator, Billy Duke and Sergeant Darrell Newman and Officer Dallas Early, both with Livingston Police Department. A vehicle search was conducted and the driver, Lumas Rasheem White, 24, of Cypress, was placed under arrest for possession of a controlled substance (felony). White's vehicle was towed from the scene by Ken's Towing and will be stored at Harrison Body Shop in Livingston. White hangs his head after narcotics investigators found illegal narcotics in his vehicle. White is escorted to a patrol unit by a narcotics deputy. Narcotics Investigator, Vance Berry uses a mirror device to get a view underneath White's Vehicle. White's vehicle was towed from the scene by Ken's Towing.